OPEN PDK COALITION MEMBERSHIP AGREEMENT – form and signature required. Membership in the Si2 Chip-Package Co-Design (aka (Open3D)) requires agreement to the following documents. First: For access to current OpenAccess and oaScript (and other extensions) source code, the member must join the OpenAccess Coalition. Second: Use of OpenAccess requires the OpenAccess–Internal Use and Distribution License V 4.0 Oct. 1, 2004. 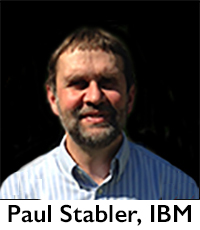 Paul Stabler, senior engineering manager in the IBM EDA organization, has been elected chairman of Si2 OpenAccess Coalition for 2017. He replaces Rudy Albachten of Intel, who assumes an advisory role as vice chairman. The OAC board oversees operational decisions for OpenAccess, the world’s most widely used, open-reference database with its own supporting standard API. A 35-year IBM veteran, Stabler currently manages clocking, design for manufacturing, and integration tools and methodology. He has been an OAC volunteer for five years. The Si2 Antitrust Guidelines are a fundamental part of our operation process. All Si2 members must agree to abide by these guidelines. This document is generally built into or referenced by each membership agreement or procedures document.